The Colorado potato beetle loves to eat the leaves of New Brunswick’s multi-million dollar potato industry. And unfortunately, the pesticide used to control the Colorado potato beetle might be hurting other helpful insects like bees. Fortunately, Helen Tai, a research scientist with Agriculture and Agri-Food Canada, and her colleagues at the Experimental Farm on Lincoln Road may have a solution – two new varieties of spud with leaves the Colorado potato beetle finds disgusting. 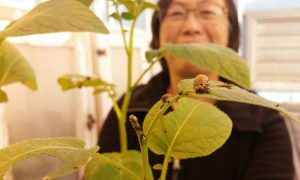 Tai, her colleagues, and her predecessors have been working for 30 years to cross commercial potato plants with their wild potato cousins from South America to produce leaves that repel the Colorado potato beetle. They now have two varieties ready for commercial testing. The next step is for the potato-growing industry to try the new potato varieties, she said. Consumers also need to be thinking about the potatoes they are eating, she said. In a greenhouse at the Experimental Farm is Tai’s Colorado potato beetle nursery, with rows of small boxes containing commercial potato plants and beetles in various stages of life. The beetle feeds on leaves in the both larval stage and the adult stage, and sometimes in New Brunswick the beetle can go through its life cycle twice in one season, she said. The beetle comes from Mexico, but it has adapted to New Brunswick’s climate and is common here. That makes the Colorado potato beetle hard to control, she said. “You can see 30 to 50 per cent loss in yield with the Colorado potato beetle so we’re very motivated to try and find some resistance,” said Tai. Tai said the timing to try the new beetle-resistant potatoes could not be better. The public is starting to get concerned about pesticides used to control the Colorado potato beetle, said Tai. If that concern keeps growing then eventually farmers may not be allowed to use such pesticides on potatoes, she said. The beetle-resistant potato would also save farmers money if they could use less pesticides, she said. Tai stresses this isn’t genetically-modified food and is totally natural.